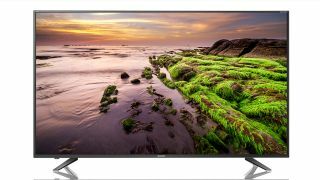 Sharp introduces 60in and 70in budget 4K TVs, from £649 | What Hi-Fi? Sharp has announced the UK availability of four big-screen 4K LED TVs with Harman Kardon sound. The new range comprises 60in and 70in screens with edge-lit LED backlighting (LC-60UI9362E or LC-70UI9362E), and 60in and 70in screens with superior direct LED backlighting (LC-60UI7652E or LC-70UI7652E). While edge-lit TVs have a row of LEDs bordering and facing the centre of the screen to disperse light across it, direct backlighting sees LED lights uniformly placed behind the whole screen, typically offering improved local dimming (i.e contrast control - simultaneously keeping the dark parts of a picture dark, and the brightest parts bright). All four models feature smarts like Netflix and YouTube, as well as three HDMI and USB inputs - all of which we’d hope would support 4K content! Additionally, they feature Sharp’s AQUOS displays, with HDR+ (not to be confused with HDR10+) technology designed to offer improved contrast and brightness, Sharp‘s Active Motion technology aimed to reduce the ghosting effect, and Wide Colour Gamut for broad colour reproduction. A built-in 2.1 Harmon Kardon sound system completes the spec sheet. The LC-60UI7652E (£649), LC-70UI7652E (£999), LC-60UI9362E (£749) and LC-70UI9362E (£1199) will be available imminently.